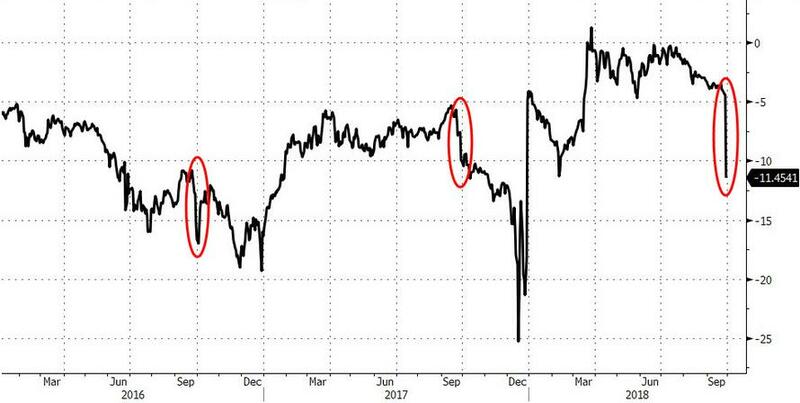 With the market's attention yesterday focused on the historic Kavanaugh hearing, it is understandable that the biggest markets story slipped by largely unnoticed: as we noted yesterday morning, that was the sudden spike wider in various dollar basis swaps (i.e. funding costs), amid what appeared to be a widespread, dollar shortage. The move was broadbased, affecting not just one pair, but virtually every FX pair, confirming that there had been a sharp repricing of dollar liquidity into year-end. So with Wall Street traders and analysts now back at their desks, and catching up on the key newsflow of the past 24 hours, the question has emerged: what caused it? Today, Bank of America has provided an explanation for this sudden dollar shortage. 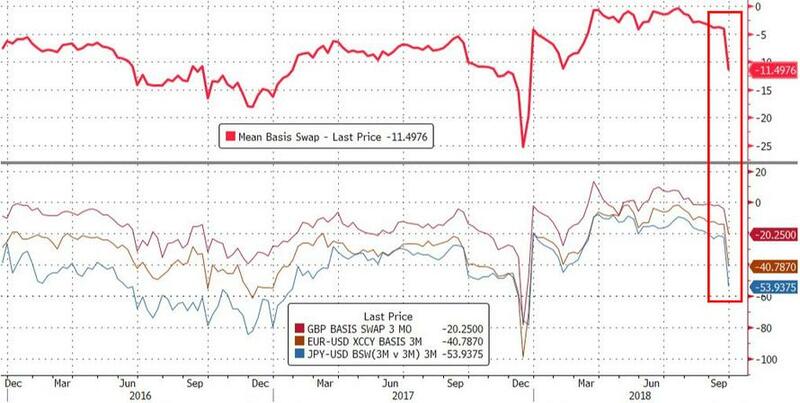 According to BofA's Yuri Seliger, the reason for these sudden increases is the fact that as of yesterday, the three-month FX forward contract extended over the year-end for the first time this year. It spiked wider, i.e., became more expensive, because banks, and in particular foreign banks, make an effort to minimize their balance sheets on December 31st for regulatory reporting purposes. As a result, according to BofA these FX hedging costs will likely remain elevated for the remainder of 2018 and normalize on the first day of the new year - a pattern that repeats every year (Figure 1, Figure 2). Ok but why the far greater move in 2018 compared to years prior? BofA has an explanation for that too, and it has to do with what changed this year, namely Trump's tax policy: the increase in costs this year was larger than what we saw last year largely in part to less funding available from corporate investors, as US companies are repatriating their overseas cash. Similarly, hedging costs based on 1-month FX forwards should spike a month prior to the year-end before normalizing in January (Figure 3, Figure 4). In other words, for all the concerns about a dollar funding shortage, it's true... but only due to calendar reasons (even though today the various swaps have continued to leak wider). That said, should the blow out in dollar-hedging costs persist, and if it fails to renormalize on the first day of 2019, the question of just who is soaking up all the excess liquidity will certainly become topical once again.